Do you need a personalized way to illuminate the road during cycling at night? 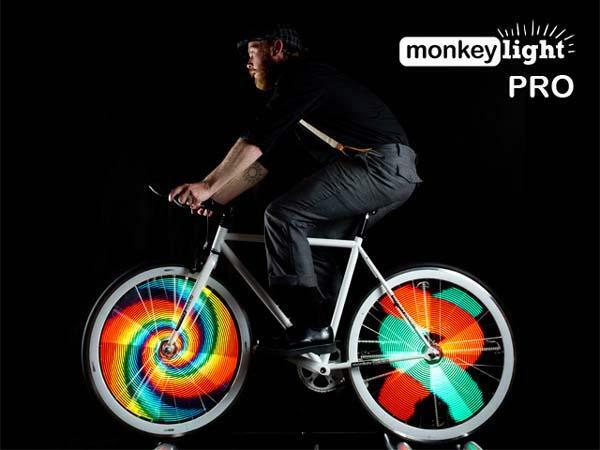 Take a look at Monkey Light Pro, the bicycle wheel light system may be able to catch your eyes. The Monkey Light Pro is a pretty damn cool bike light system designed to offer you an easy way to design personalized images and animations and display them on your bike wheel. The bike light system measures 520mm diameter by 25mm thick, and weights about 500 grams. Using Monkey Light Pro’s web-based software you can easy create a playlist with your own images and animations, while built-in Bluetooth technology you can send your playlist to the lighting system, while its 256 ultra-bright, full color LED lights display your images or animations on both sides of your bicycle’s each wheel. Apart from that, the lighting system has sensors to track its speed, heads-up position and rotation direction in order to create stable, full-wheel images from 10 to 40 mph, and its 7000mAh rechargeable battery offers 8 hours runtime at full brightness. After the break, check out the following demo video. At present the inventor of Monkey Light Pro is raising fund at Kickstarter. Pledging $660 will let you own the bicycle wheel light system. If you’re interested, jump to Kickstarter official site for more details.